Card Castles make for colorful and intriguing productions. We have regular and Jumbo sized models in our range. We now offer you this model, with miniature cards – each card in the castle measures only 2.5″ x 1.5″. 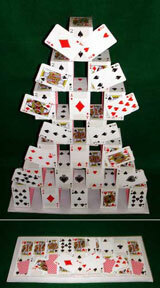 When folded, the complete castle measures only 12″ x 6.5″, allowing you to conceal this in a newspaper, or large magazine. When produced, the castle stands 17″ high .. a very impressive production.